A popular baby milestone and birthday choice. Makes a nice gift. 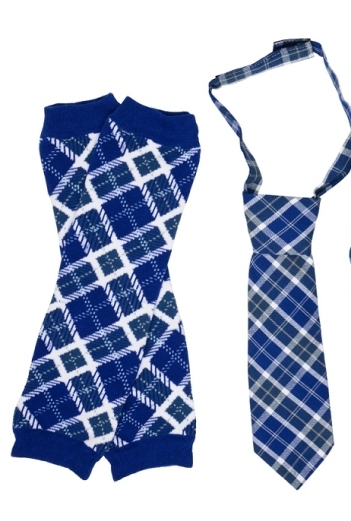 This 100% cotton blue plaid 2 - piece set includes a necktie and matching arm/leg warmers. The toddler length is 9 inches in length. The tie has a Velcro closure. The arm / leg warmers are 12 inches in length for infant and 13 inches for toddler sizes. 100% cotton tie. The leg warmers are 80% cotton plus spandex. Machine wash cold.. From juDanzy. Almost sold out. Limited quantities.